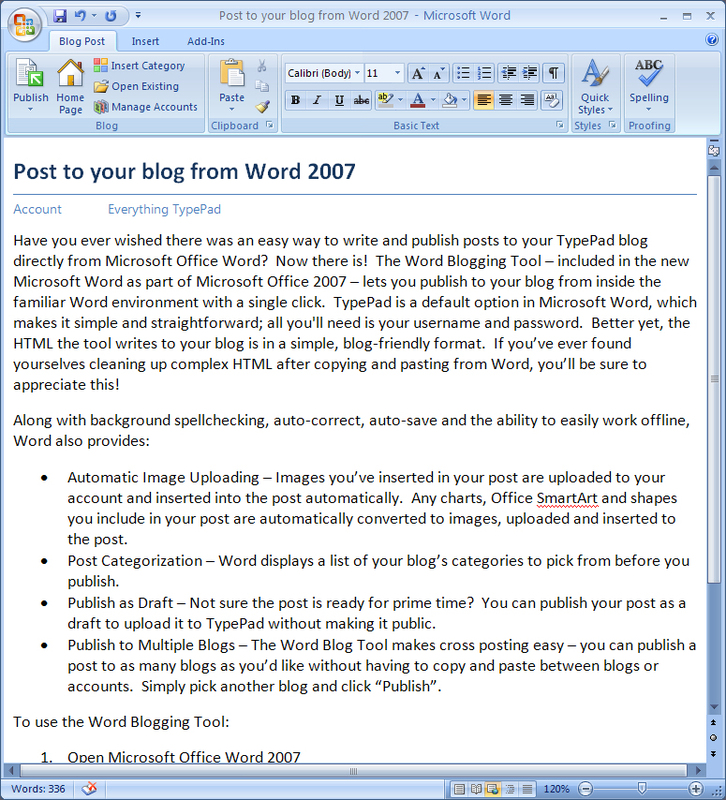 Have you ever wished there was an easy way to write and publish posts to your TypePad blog directly from Microsoft Office Word? Now there is! 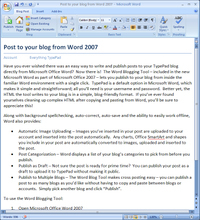 The Word Blogging Tool – included in the new Microsoft Word as part of Microsoft Office 2007 – lets you publish to your blog from inside the familiar Word environment with a single click. TypePad is a default option in Microsoft Word, which makes it simple and straightforward; all you'll need is your username and password. Better yet, the HTML the tool writes to your blog is in a simple, blog-friendly format. If you’ve ever found yourselves cleaning up complex HTML after copying and pasting from Word, you’ll be sure to appreciate this! · Automatic Image Uploading – Images you’ve inserted in your post are uploaded to your account and inserted into the post automatically. Any charts, Office SmartArt and shapes you include in your post are automatically converted to images, uploaded and inserted to the post. · Post Categorization – Word displays a list of your blog’s categories to pick from before you publish. · Publish as Draft – Not sure the post is ready for prime time? You can publish your post as a draft to upload it to TypePad without making it public. · Publish to Multiple Blogs – The Word Blog Tool makes cross posting easy – you can publish a post to as many blogs as you’d like without having to copy and paste between blogs or accounts. Simply pick another blog and click “Publish”. We’ve had a lot of fun using this tool and are sure you will too. Congratulations and thanks to the Word team for a job well done!